which has walk-to tent campsites. The most basic item for tent camping is, of course, the tent. If you are new to tent camping, don't rush out to the fancy outfitters and spend a lot of money. 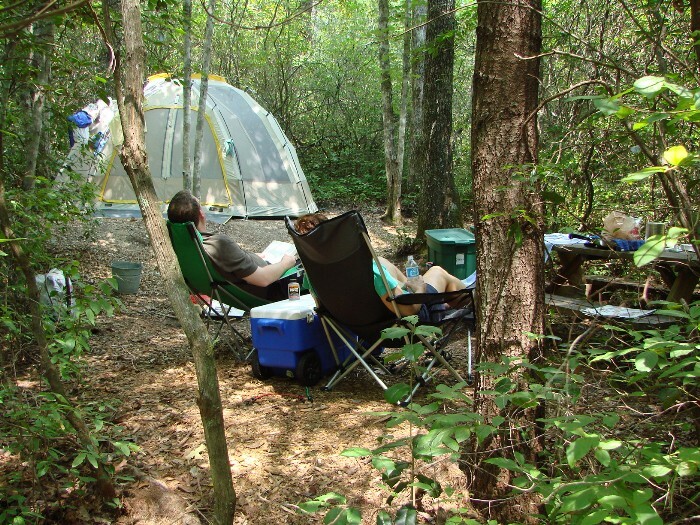 The resale value for a tent is pretty low if you discover that you don't like camping. 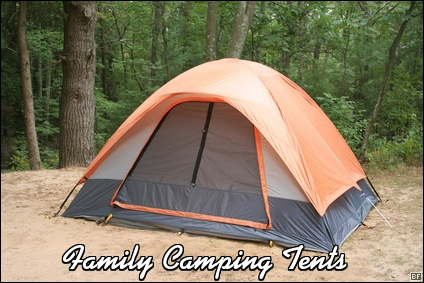 A basic tent from a discount store or from Coleman should suit you fine. In choosing a tent, the cardinal rule is "Bigger is NOT always better!". A bigger tent is heavier, has more area to get snagged or wet, etc, and may not fit on the campsite. Also, in cooler weather, a smaller tent will help hold in your body heat better than a large one. Before your first trip with a new tent, set up your tent in the yard or garage. That way, you can make sure you know how to do it and that all of the pieces-parts are with it. Also, it is a very good idea to buy seam sealer/waterproofing at the camping supply store and thoroughly waterproof the tent and seams while you have it set up. The tent may say somewhere on the box that it has been waterproofed and the seams sealed--don't believe it! When packing your gear into your vehicle on the way to your camping trip, make sure that your tent poles are with your tent. You wouldn't believe how many people arrive at their campsite and discover that they forgot their tent poles! Or you can rent a tent for your stay at Ash Grove. Click here for details. Tarps and/or plastic sheeting are necessities. You should use a tarp or plastic sheeting as a ground cover under your tent. This protects the floor of your tent from sticks and gravel and provided a 2nd barrier, helping prevent moisture from coming into the tent from the ground. This ground cover should be just slightly smaller that the floor of the tent--not sticking out beneath the tent at all. A tarp should be used above the tent to provide extra protection from rain (and it WILL rain when you go camping). Bungee cords or rope should be used to fasten the tarp to trees on the site. A lantern--either battery or fuel powered (and extra of whichever you use), matches/lighter, camp chairs and a flashlight will complete the basic campsite. Sleeping bags or air mattress? Both have their pros and cons. 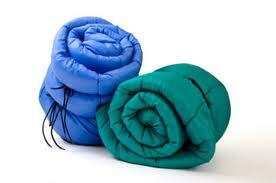 Sleeping bags have less padding, but you can get various kinds of pads where sleeping bags are sold. Sleeping bags are quicker and easier to set up/break down. Sleeping bags can be expensive,but if you are new to camping, you probably won't be winter camping, so a '40 degree" sleeping bag is a reasonably priced option. An mattresses can be very comfortable--if it doesn't spring a leak in the middle of the night and if your partner doesn't toss and turn a lot. If the weather is cool, the air inside the mattress will be cool, too, so you need insulating padding (blanket,comforter, etc) between you and the mattress, which means more bulk, more things to carry. If the air mattress is too large and it touches the sides of the tent, water will enter the tent (nothing should ever touch the sides of the tent no matter how well waterproofed you think it is). The idea of cooking over a wood fire is very romantic--but also fairly difficult for the new camper. 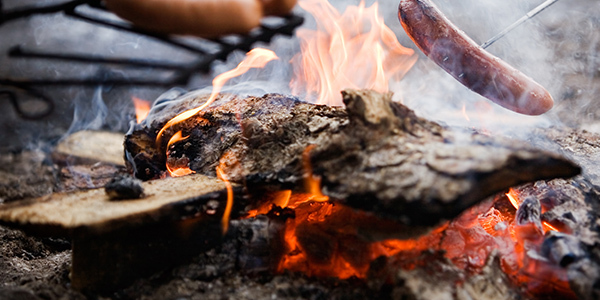 Using charcoal to cook in the fire pit & grill might be your best bet. 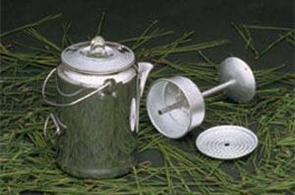 You should also have a camp stove and fuel--fastest and easiest method for boiling water, heating soups and stews, etc. If you are a coffee drinker, a stovetop percolator is worth buying, unless you can stomach the instant stuff. The basic kitchen items include pot holders, spatula, serving/mixing spoons, paring & butcher knives, cutting board, bowls, pots & pans, can opener, matches & lighter. Dutch oven cooking can be a great way to go, too. There are dozens of websites devoted to this method. Just try not to overdo it with your supplies--the more you bring, the more you have to carry and clean. Some people just want basic meat & potatoes while camping, others insist on gourmet fare. Just remember, the more you bring, the more you have to carry and clean (you will probably get tired of hearing that, but it is one of the most important tidbits of wisdom that we impart). Salt, pepper, basic spices & condiments, vegetable oil, non-stick spray, aluminum foil and paper towels are the most frequently forgotten items. If you are bringing disposables rather than your fine china, paper plates & cups (as opposed to Styrofoam) can be burned in the fire pit, creating less waste. 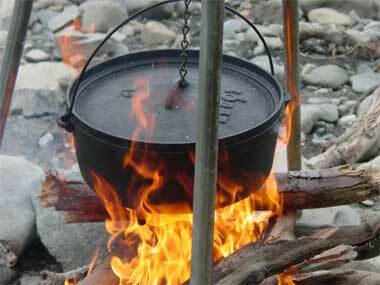 Check out these campfire cooking tips at the website of The Clymb, Inspiring Adventures.